While three high-profile cases of the disease hardly qualify as an outbreak, the cases were unusual because the infection is more likely to strike young children than it is adults, according to the Mayo Clinic. HFMD can spread quickly in child care centers, preschools and elementary schools, but outbreaks of the virus have also been reported on college campuses, where the close quarters of dorms and locker rooms mean that more people can become infected. The disease usually affects children younger than 5 years old, but older kids and adults can sometimes get HFMD too, said Dr. Luis Manrique, an infectious disease specialist at Northwestern Medicine Central DuPage Hospital in Winfield, Illinois. Usually, teens and adults have developed immunity to the disease because they have built up antibodies after being exposed to the virus in their early years, he said. A rash of flat red spots that may blister on the palms of the hands and soles of the feet. The rash may also appear on the back side of the hands and on arms and legs. Symptoms of HFMD usually appear in stages and typically don't occur all at once, according to the Centers for Disease Control and Prevention (CDC). In children, the illness usually starts with a mild fever, and a day or two later, the first signs of the disease may show up in the mouth. A child may have sore throat pain and painful sores, or blisters may develop in the back of the mouth and on the tongue, inner cheeks and gums, Manrique told Live Science. A day or two later, red spots may spread to the hands, feet and buttocks. Early symptoms in very young children with limited verbal skills may include crying more, eating less and having a temperature of up to 101 degrees Fahrenheit (38 degrees Celsius), Manrique said. The painful mouth sores may cause young children to become dehydrated if they can't drink enough liquids, Manrique said. Another clue that helps doctors diagnose HFMD is that the rash tends to be symmetrical, he said, meaning it develops on both hands and both feet. The rash might be painful, but it's not itchy like chickenpox, Manrique said. It may look like bumps with a red rim, and some may blister and have fluid inside of them. Coxsackievirus A16 is the most common cause of HFMD in the U.S., but other strains of coxsackievirus can also be responsible, according to the CDC. Enterovirus 71 is another pathogen that may be responsible for causing the infection. By touching an infected person's blister fluid. HFMD is sometimes confused with foot and mouth disease (also called hoof and mouth disease), which is a viral infection that exclusively affects farm animals, such as cows, sheep and pigs. The two diseases are not the same; humans do not contract or transmit the animal disease and animals don't get or transmit HFMD. A person with HFMD is most contagious during the first week of the illness, spreading it via respiratory secretions, according to the American Academy of Pediatrics. However, the virus can remain in the body, especially the stool, for weeks after symptoms have gone away. And some people, especially adults, can spread the virus without ever showing any signs or symptoms of the disease, according to Mayo Clinic. Wash hands often with soap and warm water, especially after changing a diaper and using the bathroom. Avoid touching eyes, nose and mouth with unwashed hands. Avoid close contact with infected people. A physical exam, including a close look at the rash and mouth sores, can help doctors diagnose HFMD. 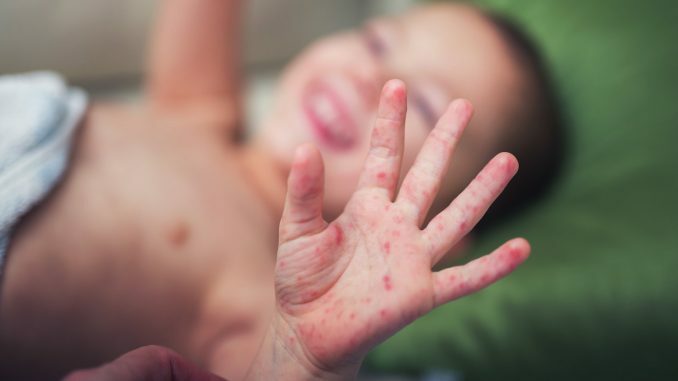 The characteristics of the rash are unique to the disease, making it recognizable to pediatricians, the doctors who see it the most often, Manrique said. In rare cases, a throat culture or stool sample may be taken and sent to a lab for analysis. HFMD is usually a mild illness that people typically recover from in seven to 10 days, according to the CDC. Children may need acetaminophen to help ease fever or pain, Manrique said. Drinking plenty of cold liquids is also recommended, but patients should stay away from citrus juices or soda, because the acids in them can cause irritation and burn mouth sores. To relieve mouth sores, avoid giving a child regular mouthwash, which may sting. Instead, a pediatrician may recommend a mouth rinse or spray to reduce pain. In rare instances, an infected person may develop viral meningitis, an inflammation of the tissue covering the brain and spinal cord, and need to be hospitalized. After having a severe case of the illness, some children's fingernails and toenails fall off, but their nails grew back without any treatment, according to the CDC. Patients may also experience peeling skin on their hands and feet after the illness has run its course. If a child has had HFMD, it's possible they'll get the infection again. Repeat infections can occur because a child may have immunity to just one type of HFMD-causing virus but not another type, making the child vulnerable to a second bout with the illness, Manrique said. More about hand, foot and mouth disease, from the Cleveland Clinic. An overview of hand, foot and mouth disease from the U.S. National Library of Medicine's Medline Plus. Read The Nemours Foundation's Kids Health page on hand, foot and mouth disease.